Could millions of jobs soon be eliminated by artificial intelligence and robots? From driverless cars to digital assistants, it seems the world of work is on the cusp of a technological revolution that is generating hopes and fears alike. But are the robots really knocking at the... read full description below. Could millions of jobs soon be eliminated by artificial intelligence and robots? From driverless cars to digital assistants, it seems the world of work is on the cusp of a technological revolution that is generating hopes and fears alike. But are the robots really knocking at the door? And what does all this mean for New Zealanders? 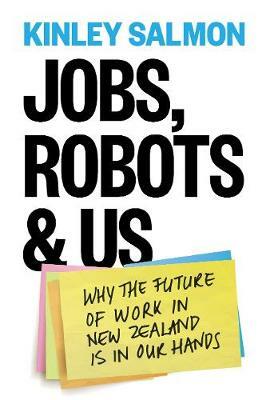 In this far-sighted and lucid book, Kinley Salmon explores the future of work in New Zealand. He interrogates common predictions about a jobless future and explores what might happen to workers in New Zealand as automation becomes more widespread. This book also asks big questions about the power we have to shape technological progress and to influence how robots and artificial intelligence are adopted. It sketches out two bold alternative futures for New Zealand - and suggests what it might take, and what we might risk, to pursue each of them. It is time, Salmon argues, to start debating and choosing the future we want for New Zealand. Kinley Salmon is a former strategy consultant and has also written for The Economist. He is originally from Nelson and now works as an economist in Washington DC. Salmon holds degrees in Social and Political Sciences and in Economics from the University of Cambridge and a Master of Public Administration in International Development from the John F. Kennedy School of Government at Harvard University.